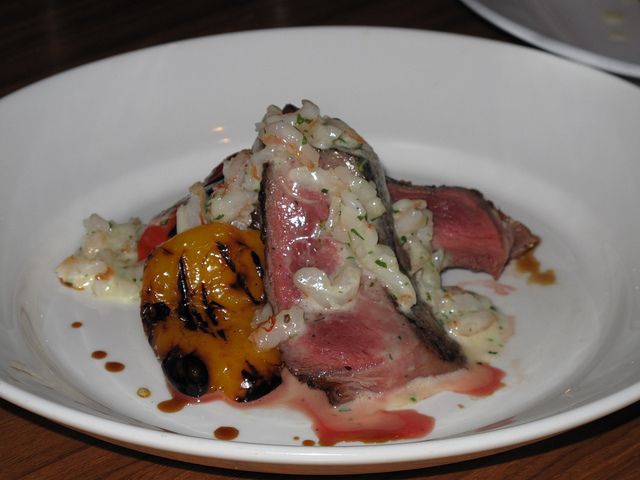 Like last year, we got to try a few of the items from Glowbal Group’s various restaurants. We met up at Coast for a tasting of their $38 menu. We were seated upstairs where Chef Pedro presented us with our first dish (of many more) for the night. 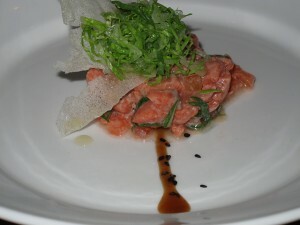 This was the Thai Style Salmon Tartar, which I really enjoyed. The galangal-lime vinaigrette was a standout, with the pepperiness of the ginger coming through. 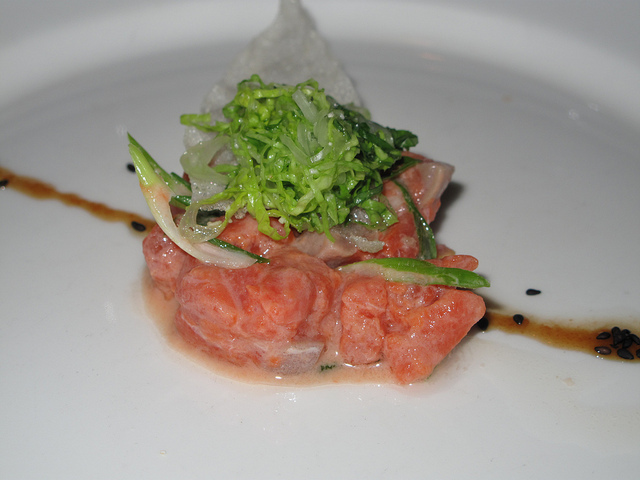 The little rice paper cracker was fun too and gave the dish a nice textural contrast. Bear in mind this is a taster version of the appetizer. The image of the actual portion size is on the right, albeit a little hard to judge with such a closeup. 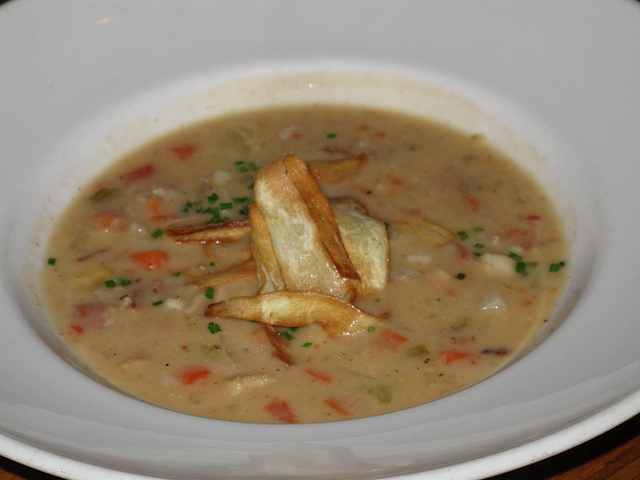 The other appetizer choice is the Bay Scallop & Clam Chowder, with roasted root vegetables and Yukon potatoes. Old Bay seasoning was used and the chowder was super thick. The flavours were a bit mild compared to the Salmon Tartar, but if you’re not into raw fish, this is a great alternative. For their entrees, Coast offered up three options, and the first one we tried was the Grilled B.C. Snapper. 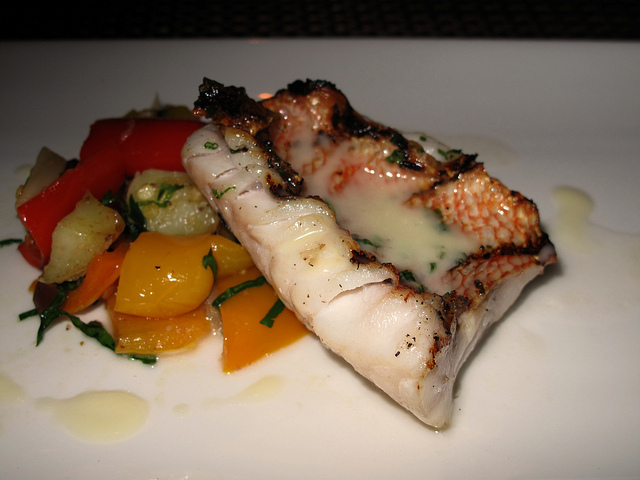 The fish sits perfectly grilled on some vegetables a la grecque, essentially fresh vegetables that are marinated and cooked with lemon or vinegar and some olive oil and herbs. The sauce is a creamy citrus beurre blanc. The citrus in both the vegetables and sauce really bring out the freshness of the snapper, which was cooked skin on, just the way I like it. The portion here is just our taster, the full portion you would get is much more generous. Another seafood offering is the Grilled B.C. Salmon, with different accompaniments than the snapper. Sitting on the bed of wild mushrooms and cauliflower puree, this dish came off heavier in texture. The salmon was a bit dry compared to the saucier snapper, but the skin had a nice crisp to it. Both solid choices and I think it’s the sides that will determine which one you choose. Not a seafood fan? Don’t worry, Coast has something that will hit the spot, their Grilled Alberta Beef “Oscar Style.” Traditionally, “Oscar style” is essentially steak served with asparagus (in this case the peppers) and a crab bearnaise sauce (substituted with prawn here). The bearnaise is rich but the flavour is quite mild. However, I’m sure you can request that on the side if you’re really not a fan. And now, there are some add-ons to let you know about. 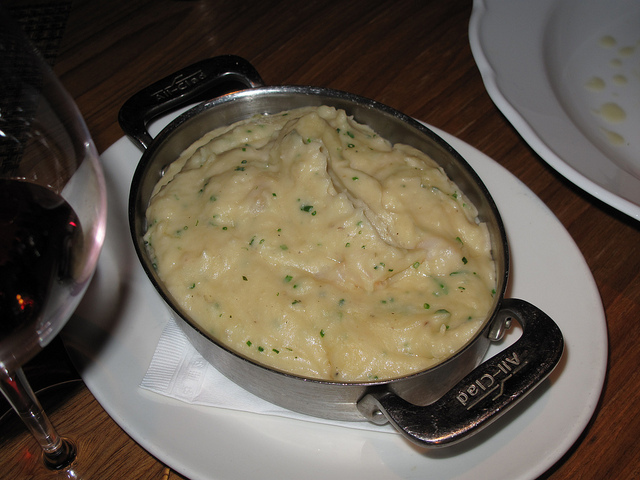 First off, you have to try the Prawn Mashed Potatoes, get one for a group of you to share. This dish is rich, creamy and decadent. I found it paired best with the beef dish. 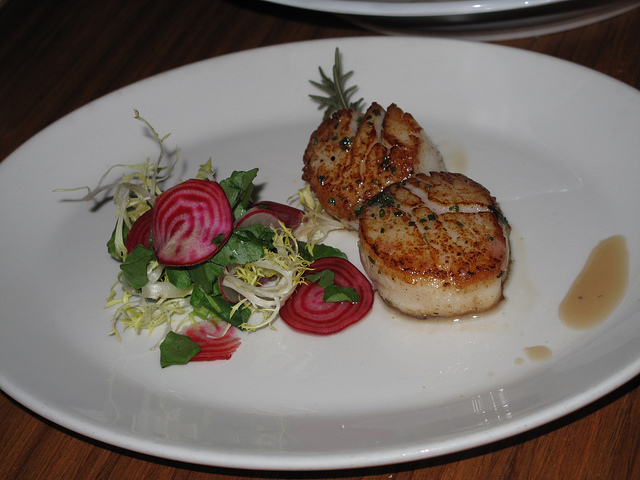 And, if you have room and are a scallop fan, do yourself a favour and get the Rosemary Scallops. They are big and sweet with a perfect crust on them. We didn’t stay for dessert but they do have a Dark Chocolate Turtle Cake as part of the $38 Dine Out menu. 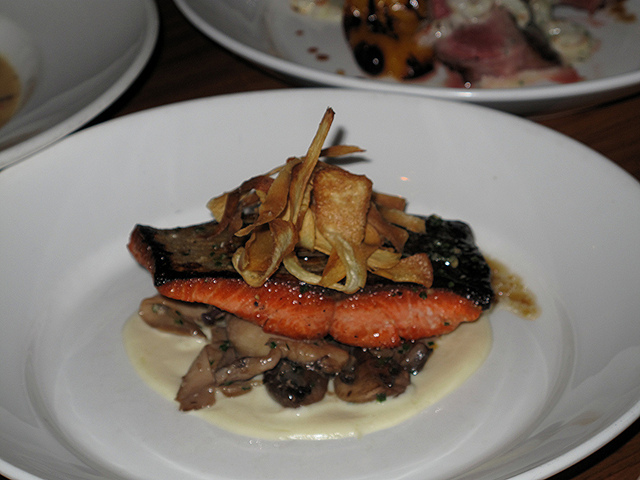 Check back in a few days for my review of Black and Blue’s Dine Out Vancouver menu!